Editor's note: Today’s guest blogger is Matt Jarrard, Deputy Director of the Healthcare Facility Regulation Division and Health Planning Director of Georgia’s Department of Community Health, which licenses and regulates health care facilities for the state. Tune into today’s webinar at 11:00am PST to hear more about how GaMap2Care is making a difference. See what other organizations that have gone Google have to say. While the State of Georgia is known for its peaches and the Atlanta Braves, it also takes pride in finding ways to make life easier for its citizens. The Georgia Department of Community Health oversees programs that serve 10 million people and regulates 7,000 health care facilities, including nearly 2,000 personal care homes. In keeping with our goals of being lean and responsive, we found a cost-effective way to serve the community with GaMap2Care, an application built on Google Maps. The app helps the public and government officials locate, visualize and monitor all the state’s licensed health care facilities. Using the app, people can locate facilities such as hospitals and personal care homes based on specialty, location, size and number of beds. They can also see satellite views or zoom in on street views. The app shows inspection reports for many facilities and other information which had previously required an open record request. Virtual tours let families quickly see if a facility meets their needs. GaMap2Care is intuitive to use because of widespread familiarity with Google Maps. The app’s rich features allow us to help people in a variety of ways. For example, lawmakers have often asked for the number of nursing homes in their district. Staff would have needed to manually compare lists prepared in a separate report to district boundaries. Now, GaMap2Care provides this information all on one map that allows lawmakers to easily determine which district the facilities belong to. 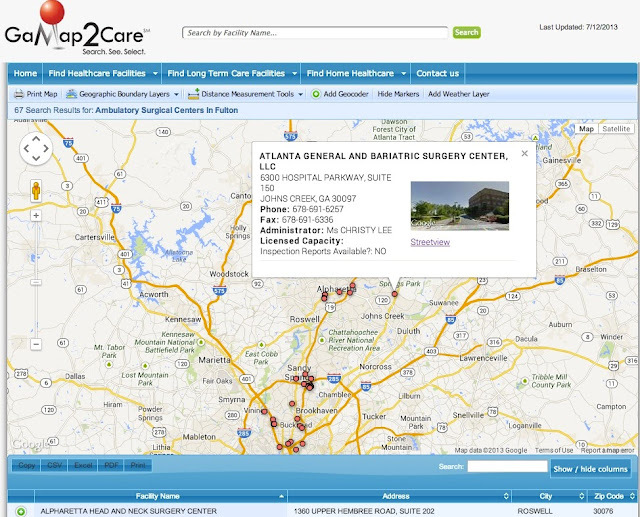 GaMap2Care is also helping state workers and officials serve the community better. Analysts setting health care policy can now more easily identify underserved areas. In addition, the state’s 165 health care facility surveyors investigating complaints or non-compliance issues can calculate distances and plan trips before they hit the road, saving time and improving efficiency. We also added additional map layers, such as populations and weather, that let officials see what facilities might be affected before a natural disaster. The app was designed and developed internally by existing staff. The ease of Google Maps’ customization enabled a programmer with no previous Geographic Information System (GIS) experience to integrate data from different sources into the map. Compared to other solutions, we found Google Maps to be easier to use, faster to load and offering more customization. A license from a traditional Geographic Information System would have required extensive user training and was expected to be considerably more than a Google Maps license. With GaMap2Care, state workers can be productive and efficient, and citizens have access to information that saves them time and helps them make critical informed health care decisions. We look forward to making GaMap2Care even more useful with the launch of the mobile version of the application in the near future, and will continue to enhance and expand features and functionality.